This was Kentucky’s first exhibition game of the Big Blue Bahamas foreign exhibition tour. UK will play three additional games during the tour. The Wildcats return to the Atlantis Imperial Arena court on Thursday vs. San Lorenzo de Almagro (Argentina). That game will tip at 7 p.m. on the SEC Network. UK improved to 131-12 all-time in exhibition games and 6-1 in the Bahamas. The Wildcats went 5-1 in their previous trip to the Bahamas in 2014. Kentucky has won its last 10 exhibition games dating back to Nov. 2, 2014, vs. Pikeville. Kentucky’s starting lineup featured Quade Green, Immanuel Quickley, Keldon Johnson, PJ Washington and Nick Richards. Johnson scored the first points of the trip with a pull-up jumper just inside the right elbow 3-point line. Kentucky stormed out to a 13-0 lead in the first three minutes, highlighted by two dunks from Richards and Washington. Richards was unstoppable early in the first half. He reached 10 points just five and a half minutes into the game and scored 14 for the half. The Bahamas clawed back after the fast start and cut the Wildcats’ lead to 25-22 with 7:54 left in the first half. The Bahamas would get as close as two points on several occasions. Tyler Herro and Ashton Hagans helped UK earn some breathing room with some solid play late in the half. Hagans was all over the floor defensively with three steals while Herro scored 12 points in the first half. The Bahamas quickly erased a seven-point deficit with a 7-0 run to start the second half in the first 1:37 of game time to tie the score at 42-42. It was the game’s first tie. The Bahamas team took its first lead of the game at the 16:44 mark on a layup by Jerome Burrows to go up 44-43. Herro got the lead back on the following possession with a leaning layup. Washington’s bank shot with 15:14 left gave UK a 47-45 lead it would never relinquish. Kentucky went on an 11-2 run after the game was tied 45-45 and pulled away. Kentucky used its size to good advantage, outrebounding the Bahamas 57-45 and winning points in the paint, 46-30. Kentucky scored 20 points off turnovers and gave up just three from its own miscues. UK had 13 steals, compared with two for the BNT. UK committed just eight turnovers, compared with 15 by the BNT. Nick Richards led all scorers with 19 points, including 14 in the first half. He was 6 of 7 from the floor and 7 of 8 from the line. Had it been a regular-season game, it would have been his second-highest scoring output in a UK uniform. He posted 25 points vs. Fort Wayne as a freshman. He also blocked a team-high two shots. Tyler Herro notched 16 points, including 12 in the first half. Reid Travis showed off the rebounding ability that helped him to back-to-back All-Pac-12 selections at Stanford. He grabbed a game-high 14 boards. Travis, a transfer from Stanford, averaged 19.5 points and 8.7 rebounds at Stanford a season ago. Only 1 game, and these numbers will be more significant Sunday night after all 4 games are in the books. Nevertheless, last night’s defense was very strong, especially for a first game ever, allowing 61 points on 82 possessions (0.743 ppp). Yes, there were some rough edges, but the defense was impressive forcing turnovers, limiting offensive rebounds, and limiting opponent shooting percentage. Offensively, the shooting was abysmal. Perhaps that was first game jitters, or playing in a ball room with curtains on the walls, or a low ceiling, or ….. Regardless of the reason, I believe this team is loaded with shooters, and I am anxious to see Baker play. Injured again? On the shooting, I have a question for those here who are players. I thought I noticed unusual arm motions and a tendency to shove the shot toward the basket rather than a pure release of the shot from the perimeter. Did anyone else notice this? I would like to hear from the rest of you about this observation. As noted yesterday in another thread, I am hoping to see an average margin over the course of these 4 games of at least 13 points, and upwards of 20 points would be impressive. Last night’s 24 point margin is an excellent start. I suspect that last night’s opponent will be the weakest of the 4, and I expect the Cats’ efficiency will improve over the next 2 games. Finally, last night’s 82 possessions was very encouraging. 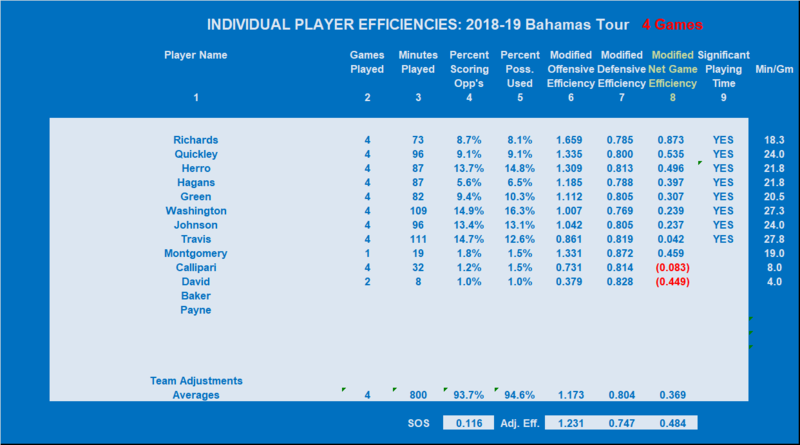 4 years ago in the Bahamas, that team averaged 69 possessions per game, and only 62.4 possessions per game for the ensuing season. When is the last time any UK team shot the ball 81 times in a 40 minute ballgame? Only 8 turnovers in 82 possessions!!!! As is normal, thank you for your incredible insight into the games UK plays. I played semi pro basketball for the US Navy during my time in the European theater of operations during the 80’s, and 90’s timeframe. You asked a question about the shot mechanics and while watching the players (at least some of them). I did notice that their shot motions weren’t consistent, nor was it as smooth of a motion as it should be. I noticed a pushing/shoving of the basketball shot mechanic instead of the ball rolling off of the finger tips to give that smooth ball rotation and follow-thru motion that you want to see each and every time a shot is taken. Like you, I chalked the poor shooting to the fact that they were in a ball room with low ceilings, first game, and also the lighting could have played a factor. I do think we have some really good shooters, and don’t think that will be an issue moving forward especially once the regular season starts. Overall I came away impressed (minus the shooting) for this to be their first game, and I truly have a good a feeling about this team moving forward. The defense at times was very good and other times lacking (I think their legs got tired and mentally they had some lapses). But again the intangibles are there and I’m very excited for our team as we continue to grow and get accustomed to playing together. Thank you always for your insight on the games.